This small six story tower has graced the north shore of Town Lake for many years, however, not many people, including long-time Austin residents can tell you what purpose it served. 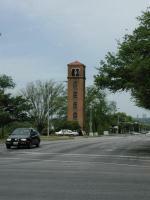 These days the tower sports a carillon that rings out tunes several times a day. Was it a church steeple? Actually, the building was erected in 1930 to provide the Austin Fire Department with a "high rise" building on which to train. As the city grew in size it became impractical to train in the center of town. In 1974 the fire department built a new fire drill tower, incidentally also six stories tall, on Pleasant Valley Road in southeast Austin. 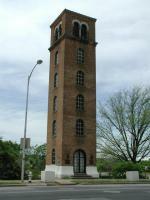 In 1978 Mrs. Effie R. Kitchens, whose late husband built the tower donated $30,000 towards a project to restore the decaying structure and add its distinctive carillon. In keeping with its Fire Department roots, the structure was named for Captain James L. Buford, an Austin fireman who died in the line of duty on June 17, 1972 while attempting to rescue a 15-year old boy during a Shoal Creek flood. The carillon was called the Kitchen Memorial Chimes. Stopped by during my lunch hour to log the visit. The photos are from an earlier visit when I didn't log a find. The tower seems pretty tiny against the buildings to its north now!